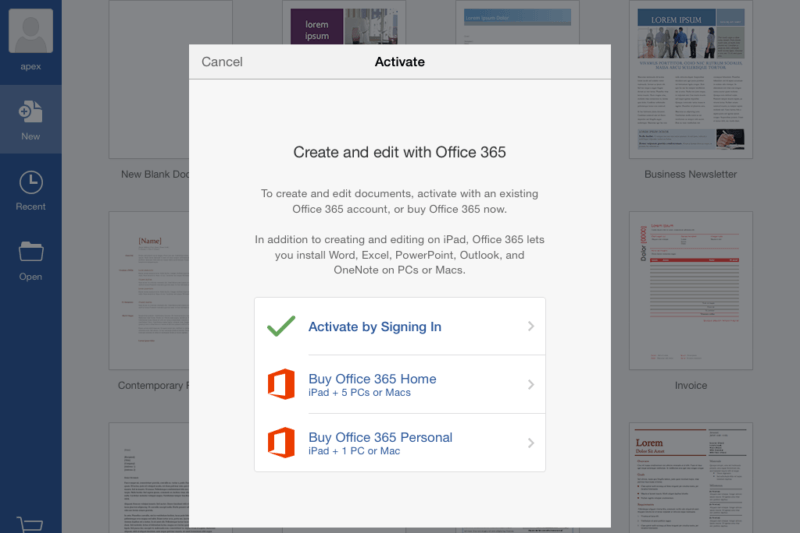 Microsoft has added monthly subscriptions to Office for iPad, giving users another option to access their Office 365 Home or Personal plans besides paying for the entire year upfront. The new payment option will be available right from within the Word, Excel and PowerPoint apps for iOS. The Personal edition, which costs $69.99 per year, will set you back $6.99 per month if paid on a month-to-month basis. Meanwhile the Home edition, which costs $99.99 per year, will cost $9.99 per month. Office 365 Personal allows you to run Office on one PC or Mac and one tablet, while Office 365 Home is for households with up to five PCs or Macs, plus five tablets. Both offer 1TB of storage and 60 minutes of Skype calling per month to more than 60 countries. Existing users who have purchased Office 365 Home for one year, will continue on the same subscription. If you buy a monthly subscription on your iPad, you can switch to an annual subscription from your iPad, or from iTunes on your PC or Mac. Although Office for iPad, which Microsoft launched back in March, is free, it only allows you to view documents and spreadsheets, and present PowerPoint slideshows. You need an Office 365 subscription to unlock functionality like creating, editing and formatting documents, and saving to OneDrive or SharePoint. The updated Microsoft Word, Excel, and PowerPoint apps for iPad are available in the App Store now.